Bruce was already a grizzled veteran of the British Blues and Beat scenes before he ever strapped on a Gibson EBO bass for Cream. Bruce played with Manfred Mann, John Mayall and Alexis Korner before he formed Cream in 1966 with Ginger Baker and recently anointed “God” Eric Clapton. Cream was one of the first “jam” bands to crash the Billboard charts. They had monster hits with “Sunshine Of Your Love”, and “White Room”; both featuring Bruce’s supple but solid bass work and his honey-sweet tenor. Jack Bruce’s voice was able to sell the hits as well as the blues standards that were the backbone of Cream’s live repertoire. Moreover, his voice and playing have remained strong over the years, despite the travails of substance abuse, a harrowing liver transplant, three divorces, and financial misadventure. In Cream, Clapton got the accolades and the celebrity, but Jack Bruce delivered the panache’. Later in his career, Bruce began exploring the fret-less bass. His bass playing always had a rubbery, liquid quality; so the move made sense. Bruce could be as athletic in his playing and singing as you could want. But, his roots were the blues. Here is Bruce at the 2005 Cream reunion unbowed by a recent near death surgery, deconstructing Albert King’s “Born Under A Bad Sign”. Note his comping behind Eric Clapton’s guitar solo. A master class on how to play the blues without being a root-chugging automaton. 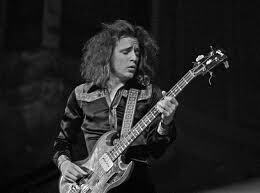 Jack Bruce, an absolute original and master of the art of improvisation on the bass and vocally!